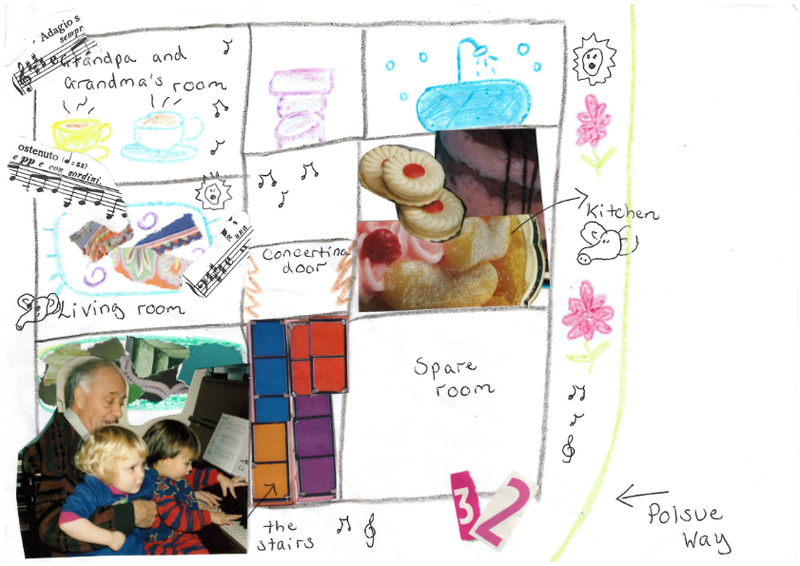 I wanted anyone reading my memory map to enter into my five-year old mind, hence the use of crayons (my favourite) and lots of pritt stick on my map. I found the creative journey to be fairly emotional. My Grandfather passed away a few years ago, so it was a case of diving into some memories and experiences that I had previously squirrelled away. We spend many an idyllic holiday in Cornwall as kids, raiding the dressing up box and stuffing ourselves silly with sweets and biscuits. These were happy, magical times and I still enjoy reminiscing about the Tesco computer episode with my younger brother. While there were too many endearing anecdotes to share, I chose a few that stuck in my mind. I wanted to share the most mundane, everyday memories with my reader – as these experiences are what made 32 Polsue Way for me. Number 32 is on the corner. I always sleep downstairs in the piano room on the squishy green sofa when we visit Grandpa Eric and Grandma Margaret. The downstairs front room is my favourite, it’s where I can play duets with Grandpa, and I help him on the computer – so he doesn’t order thirty-two bags of flour again from Tesco, because that made Grandma cross. I love the kitchen too, it’s where I help Grandma bake cakes and biscuits, and she wraps me up in her apron. You can see across the creek. When it’s raining we go through the concertina doors into the living room, and put ‘Carnival of the Animals’ on the gramophone. We swirl around the room, lions and elephants, round and round the patterned carpet. I like it best of all when we sit in Grandma and Grandpa’s room until late in our pyjamas, drinking tea.